The Portland Traction Company, also known as PEPCO a confusing acronym of its one-time parent that became a sort of nickname for the interurban that always stuck, served its namesake city in Portland with a history that dated to the early 1890s. What began as a single system culminated into a network of radiating lines stretching outward from Portland in several different directions and encompassing a number of predecessor lines. Interestingly, the Portland Traction name was not used until the 1940s during which time the road's passenger operations were in decline. 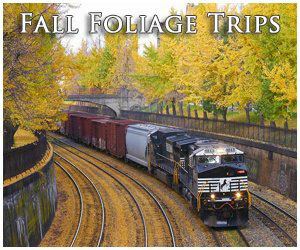 From the 1960s, onward, the company persisted as a freight-only endeavor, a subsidiary of the Pacific Northwest's largest two Class Is. It was more or less successful in this new role, although as traffic declined cutbacks continued through the 1980s. 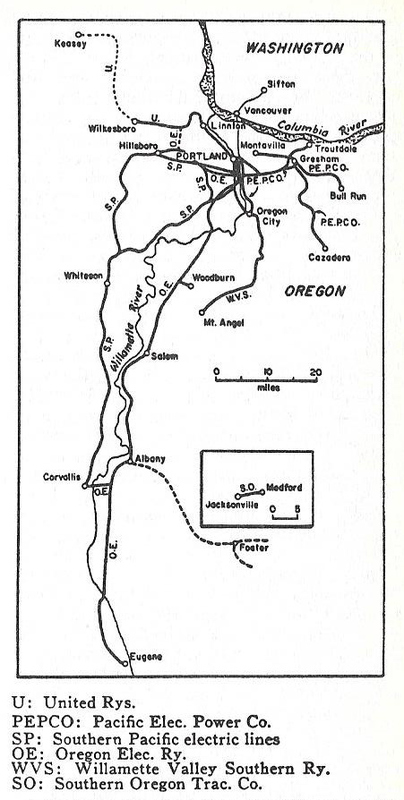 Today, just a brief segment of the original PEPCO remains south of the city, operated by shortline Oregon Pacific Railroad. The history of what became the PEPCO begins with the chartering of the East Side Railway Company in July of 1891, which hoped to construct an interurban line from East Portland south along the Willamette River to Oregon City. 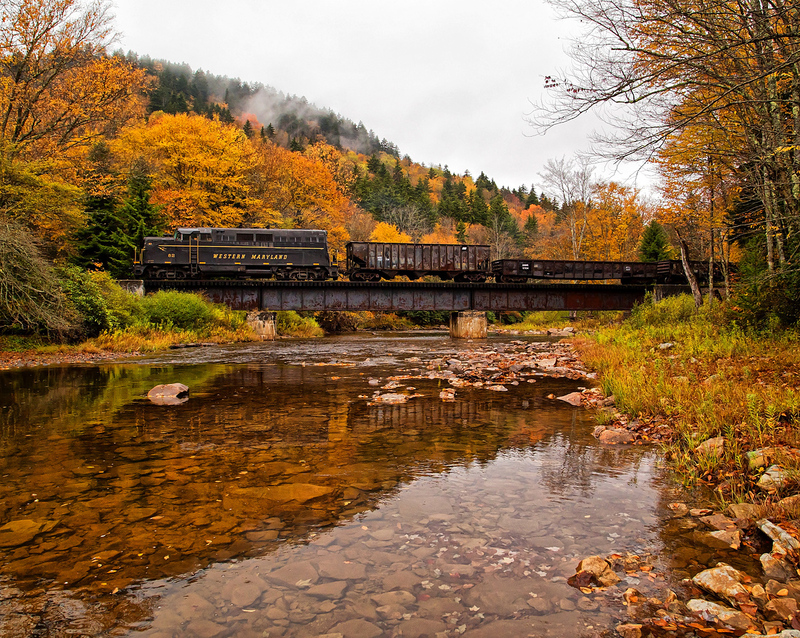 The route was about 10 miles in length and was completed within two years, opening for business on February 16, 1893. Unfortunately an economic downturn at the end of the 19th century forced the company into receivership in 1900 and it emerged as the Portland City & Oregon Railway, which was owned by the Oregon Water Power & Railroad. Soon after this the Portland-Oregon City main line was double-tracked, so to speak, with a secondary route built along the west side of the river. Additionally, by 1902 an extension was underway way east of Golf Junction to Gresham and in 1904 was completed to Cazadero (a distance of 36 miles) where a new power plant was established at Boring (north of Cazadero it allowed the line to be fully electrified). 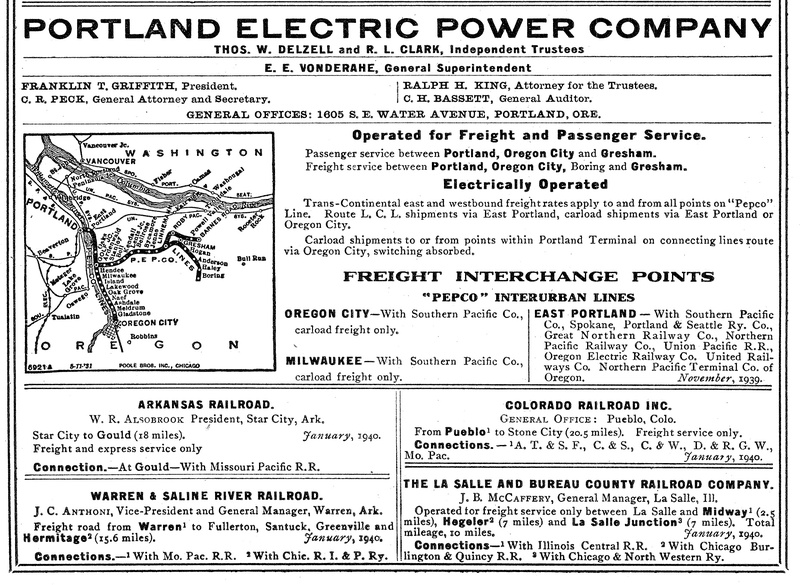 Oregon Electric Railway, From Portland To Eugene: "The Willamette Route"
A few years later in 1909 another short addition occurred when a branch was opened from Gresham northwest to Troutdale (about 5 miles). By this date the interurban era was in full swing with numerous new lines either already in operation or under construction all across the country. This was certainly the case for the then Portland Railway Light & Power Company (the property had been acquired in 1906 by Philadelphia interest and renamed), which continued to expand post-1910; it acquired the Mt. Hood Railway in 1912, a small interurban that had opened just a year earlier on August 1, 1911 between Montavilla and Bull Run via Gresham. 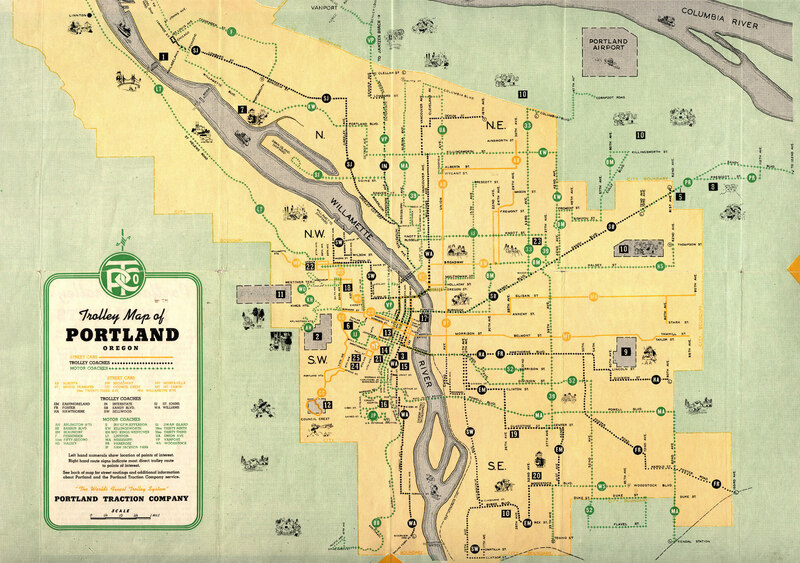 Also by this date the OWP&R had already reached downtown Portland along its own tracks and overall its system stretched roughly 75 miles, excluding all spurs, double-tracking, and street railway operations. Along with the Pacific Electric Railway, Sacramento Northern and Oregon Electric, the interurban grew into one of the West's largest. After 1912 the PRL&P no longer saw additional growth outside of focusing on its freight business and adding short spurs and extensions. 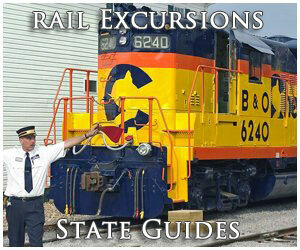 Interestingly, while the PRL&P utilized common interurban equipment during the era that ranged from J.G. 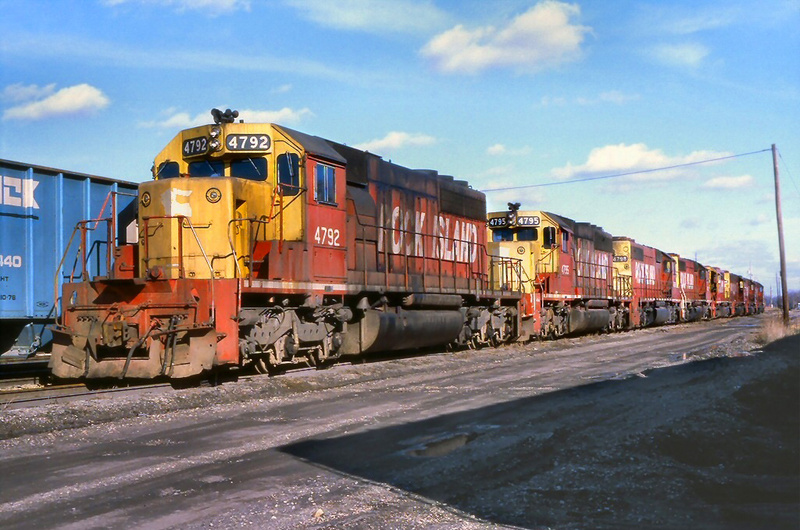 Brill, Birney, and Kuhlman cars to General Electric steeple-cab motors for freight service the company also operated some steam locomotives including four geared two-truck Shays, 4-4-0 Americans, an 0-6-0 switcher, and tiny 2-4-2 "dummy" models for street operations. The Shays were utilized for heavy freight service and the dummies only saw service until the street lines were electrified. In 1924 the property was renamed as the Portland Electric Power Company, or PEPCO, which operated both the interurban and streetcar lines as well as provided electricity for the city (these combined services actually dated back to PRL&P as well). The first cutbacks of the system began in the late 1920s with the abandonment of the Montavilla-Troutdale line in 1927. Much of this was brought on due to the Great Depression such as the abandonment of the Gresham branch to Bull Run in 1931 and the Cazadero Branch ending service south of Boring in 1933. Interestingly, through the 1940s and especially during World War II PEPCO saw relatively strong passenger demand, which is all the more impressive when one realizes that most interurbans had ended such service between 1920 and 1940 or outright shutdown due to growing competition from automobiles. 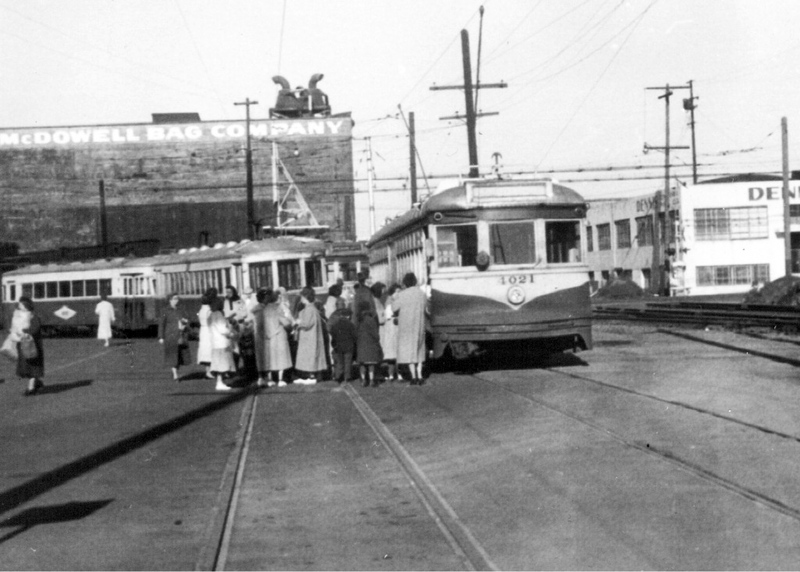 In August, 1946 the company was again reorganized, this time split into different operating territories; the streetcar/city lines were operated as the Portland Transit Company while the interurban routes became the Portland Railway & Terminal Division of the Portland Traction Company (it was also placed over the city lines). 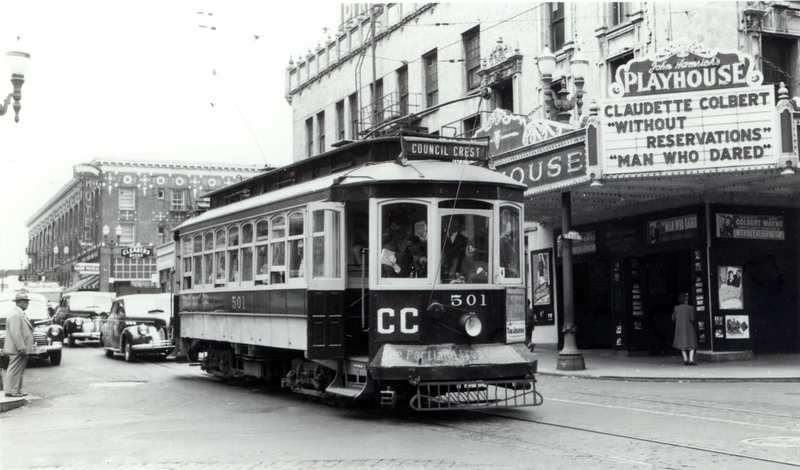 In 1958 passenger service ceased entirely across the system, which also marked the end of all electric operations (this all but shutdown remaining streetcar operations). 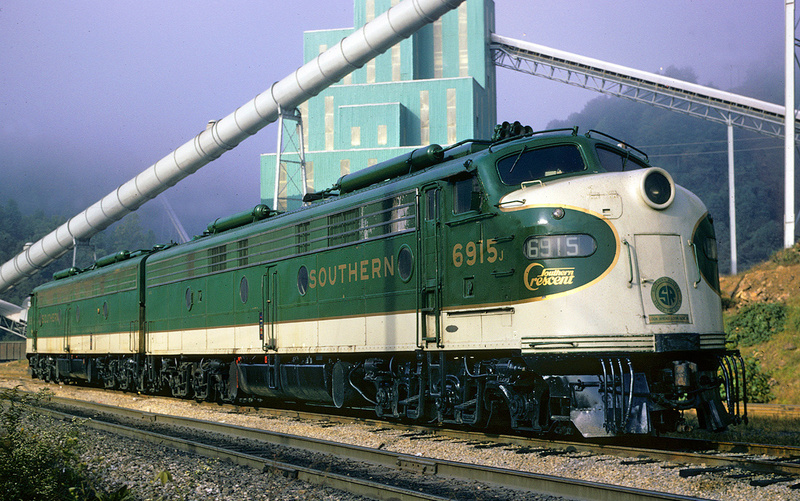 The company had purchased two EMD SW1s a few years earlier, #100 in 1952 and #200 in 1953, which took over completely for the electrics after 1958. The addition of the new diesel switchers led to a fascinating operating practice; because the PEPCO's crossing mechanisms were controlled through the catenary the little switchers had to be equipped with a trolley pole to activate the systems. Due to all of the different corporate names the company was called everything from PEPCO and PRTD to the PR&T, Portland Traction Company. It is fascinating that even after Union Pacific and Southern Pacific acquired joint control of the property in 1962 the PEPCO name persisted essentially through the end of their control (even being listed on timetables) in the 1980s. The 1960s also witnessed the start of a slow death for what remained of the property; in 1968 the original main line south of Milwaukie was abandoned as only a single shipper remained, a paper mill. Sadly, the 1970s through the early 1980s were particularly rough as customers simply began to close their doors. Around 1986 all trackage east of Golf Junction was embargoed and UP/SP sold the right-of-way to the city in 1989 (part of the ROW near Gresham is now used as the MAX Light Rail system). What remained was about a 6.5-mile stub of the original route between East Portland and Milwaukie, purchased by Richard Samuels in 1987 from UP/SP to salvage rail service to his steel company. 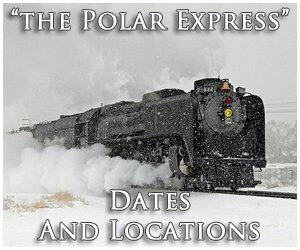 He named the operation the East Portland Traction Company, which later became Oregon Pacific Railroad, and used the interurban's original SW1 #100 for power. 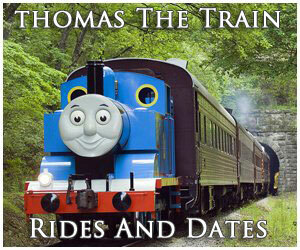 The diesel is still in use today as is the shortline. Officially, the PRTD ceased to be an operating entity as of April 1, 1991 but reportedly it still survives as well, as a real estate company. To learn more about the history of PEPCO please click here.